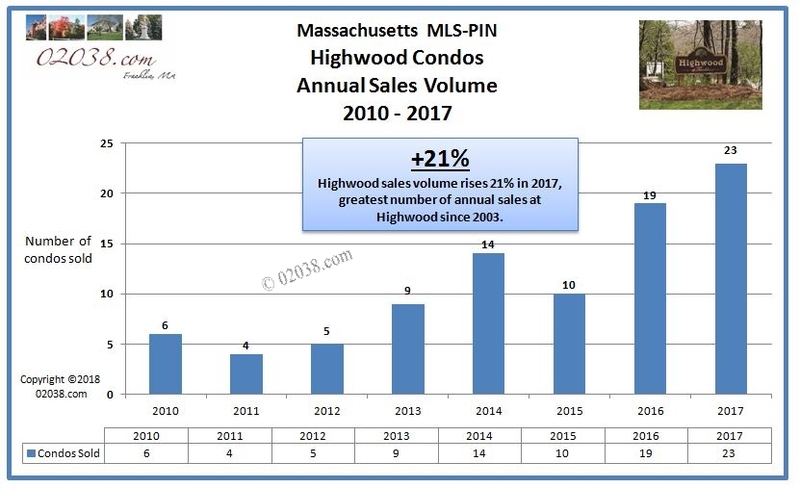 2017 was a very strong year for sales at the Highwood Condominiums in Franklin, MA. The number of Highwood condos sold in 2017 ballooned to 23, compared to 19 the previous year. According to data maintained by MLS-PIN, it was the largest number of unit sales at Highwood since 26 units changed hands back in 2003. The average sale price of condos at Highwood rose 4.3% in 2017 to $206,509, compared to $198,074 the previous year. 2017’s average price is 40% higher than 2010’s average sale price of $147,313 – quite a comeback from the Great Recession low! You can download the complete Highwood Condos 2017 Sales Report by following the hotlink at left or in the image below. 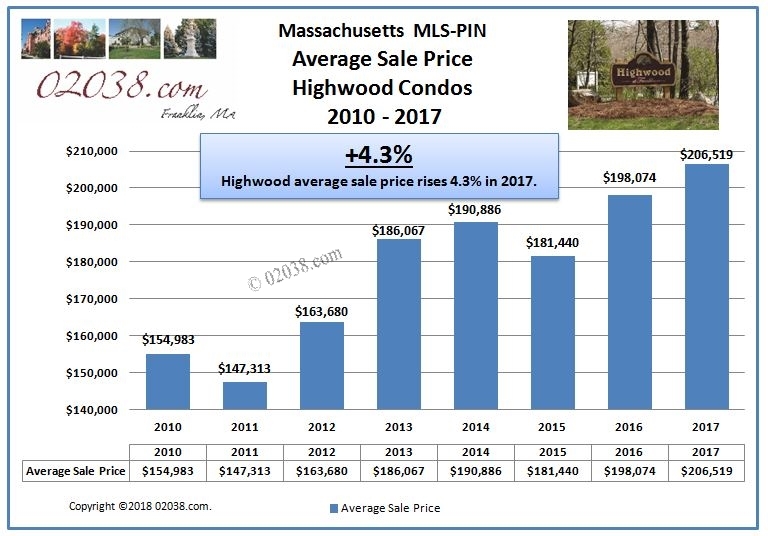 The Report gives you facts, figures and lots of photos for every unit sale at the Highwood Condos in Franklin,Massachusetts to took place in 2017. But you can get a better sense of the 2017 market for condos at Highwood by breaking down the sales by association at Highwood. That’s because there are THREE separate associations at Highwood (Highwood I, Highwood II and Highwood III). Each association has its own architectural characteristics and floor plans. These differences contribute to some important sale price variations between homes in each of the three associations. Eight condo units in the Highwood I association sold in 2017. Of these eight sales, five were one level garden condos. Prices paid for the garden units ranged between $180,000 – $192,000. Two ranch style units in Highwood I sold (for $206,540 and $216,000 respectively), while one townhome (defined as a condo with at least two stories) changed hands for $210,000. You can learn more about Highwood I here. Six Highwood II units sold during 2017. Two were garden units (which sold for $190,000 and $203,000 respectively). Three Highwood II townhomes sold for prices ranging between $206,000 and $230,000. A ranch unit rounds out 2017’s sales at Highwood II. This condo sold for $213,000. 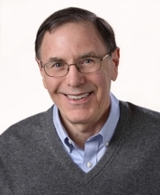 Follow the hotlink at right to learn more about the Highwood II association in Franklin, MA. Two ranch units at Highwood III sold in 2017. These condos sold for $203,000 and $210,000 respectively. 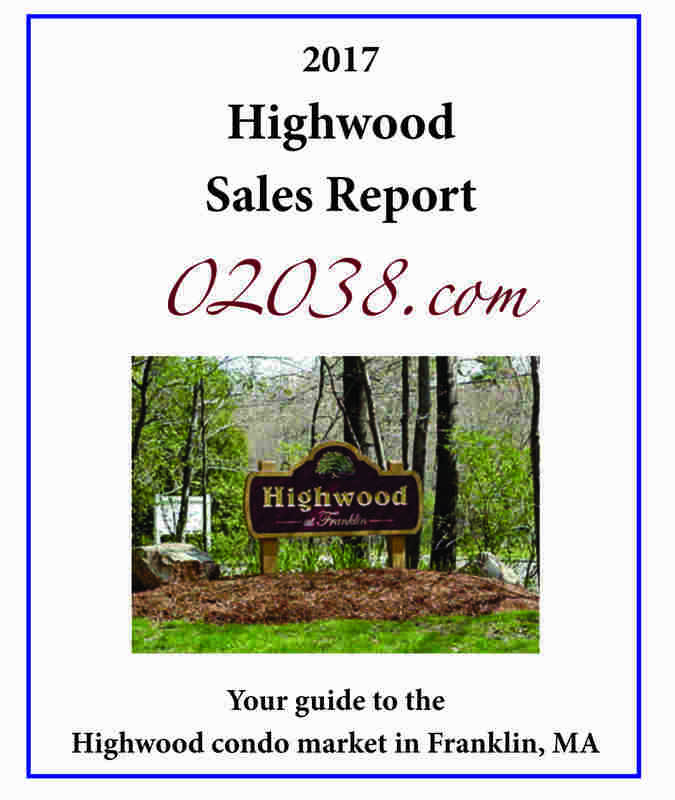 Follow the hotlink to learn more about the Highwood III association in Franklin, Massachusetts. The 2018 real estate market in Massachusetts looks to be another banner year. So we can expect more price appreciation at Highwood in the coming 12 months!